Members Only — MAD STRATEGIES Inc. It caused shockwaves throughout the marketing world. Mike Jeffries, who was the CEO of Abercrombie & Fitch at the time, openly declared that their company refused to market or sell clothes for women who need a size XL or above. If the message wasn't blatant enough, he stood by it and reiterated his decision by saying, "We want to market to cool, good-looking people. We don’t market to anyone other than that." So, in case there was any ambiguity, although popular estimates indicate that more than 60% of North Americans are overweight, Abercrombie & Fitch is only interested in dressing the 40% who are not. Most businesses want to cast the widest net possible. However, there are some companies that simply don’t care. Their brand is for a chosen few, and everyone who doesn’t jive with their branding is (strongly) encouraged to go elsewhere. The payoff? Protecting an image and building an alliance. Lululemon decided their clique would exclude anyone larger than a size 12, and if they had it their way, no one above a size 10 would don their brand. As reported by the Huffington Post, employees were asked to “hide” all double-digit sizes. Thus, someone is no longer just purchasing a product - they are granted admittance into a club. And just the mere idea of being given access entices would-be consumers. 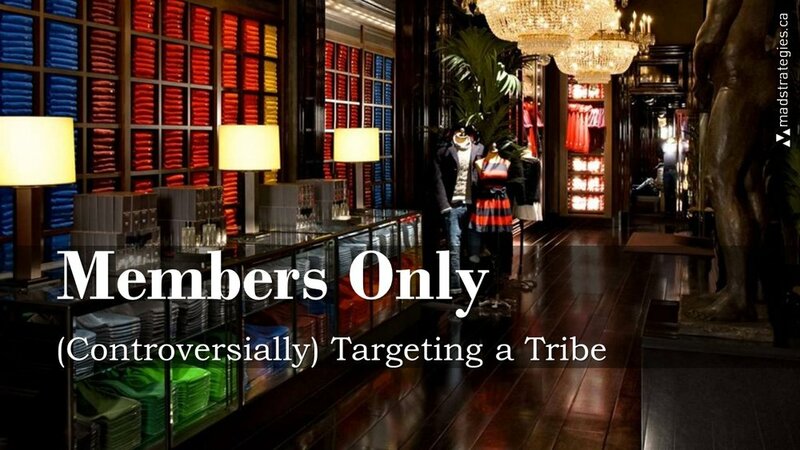 It’s no longer about wearing a brand, it becomes a uniform for a tribe. "The reason companies like Lululemon (a trendy yoga apparel company) can charge 98 dollars for a pair of yoga pants is because people buy into the image they are selling." This method, also known as niche marketing, works because of the simple, fundamental principle that everyone just wants to belong. Ramona Sukhraj explains in her piece on Impact, "It is human nature to want to find a group of people you just click with; to find your tribe, so to speak, and in modern marketing, this need can be an invaluable asset to growing a business and loyal fanbase." If a business decides to only cater to an image, they are within their rights to do so. Sure, there may be some consequential lost revenue and public backlash from people excluded from their tribe. However, it can develop into an advantageous following of loyal consumers, willing to pay a premium for products, and proud to represent and display their membership privileges for all to distinguish.